President Trump's latest round of import levies on Chinese imports will add costs to more than 100 car parts. New tariffs imposed by President Trump on auto parts from China will hit carmaker profits, cut sales and threaten to “start a downward cycle” in the critical industry, analysts said unanimously Tuesday. In addition, if you’re in the market for a new car, you probably should get to a dealership soon, because prices are going up. Trump’s latest round of tariffs on Chinese imports will add costs to more than 100 car parts — a 10 percent levy on everything from tires and brake pads to engines and batteries — that go into cars made and sold in the U.S.
Analysts said it is unclear how much car prices will go up in order to absorb the costs of a trade war, but everyone agrees that prices must go up — and that parts from China are critical to the auto industry. Car sales will drop as a result, analysts said. “This is definitely the “Mother, make it stop” point for the auto industry,” said Jon Gabrielsen, a market economist who advises automakers and auto suppliers. It looks like the U.S. will see a 10 percent tariff applied this month that goes up to 25 percent on Chinese goods on the first of the year, Gabrielsen said. That’s just parts, not the full cost of a vehicle. Automakers didn’t comment on how they planned to absorb the costs associated with the policy change. Dearborn-based Ford was assessing the situation. Fiat Chrysler declined to comment on the impact of the new tariffs. General Motors declined to respond to request for comment. Gabrielsen said some of the costs must be passed on in sticker prices. 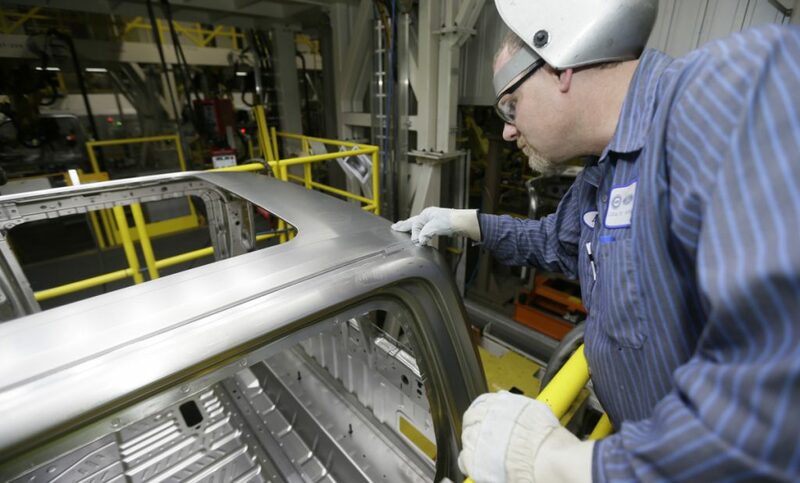 Automakers can produce cars for about a month before the costs associated with the 10 percent tariff take effect. “By Februrary 2019, people will feel it,” Gabrielsen said. Gabrielsen said it took him nearly three hours to analyze the list of car and light truck items imported from China facing new tariffs effective Sept. 24. Jeoff Burris, founder and principal of Advanced Purchasing Dynamics, which has been doing extensive work in automotive supply chain for the past 14 years, offered a grim assessment. A spokesman for the National Automobile Dealers Association referred inquiries to a study done by the Center for Automotive Research that the trade group commissioned. Its results were delivered during testimony before the U.S. Department of Commerce in July, when auto industry officials urged the Trump administration not to impose tariffs on cars and parts. How much will prices rise? n 2 million fewer new vehicles sold per year. n Total U.S. employment losses of nearly 714,700, and GDP losses of $59.2 billion. n A loss of 117,500 of 1.1 million U.S. new-car dealership jobs, with the average franchised dealership losing seven jobs. n An increase in used car prices due to heightened demand and constricted supply. Welch urged leaders in Washington to exercise caution. Welch emphasized that new tariffs would reduce consumer choice; increase the cost of used vehicles; and raise the cost of getting vehicles serviced and repaired.